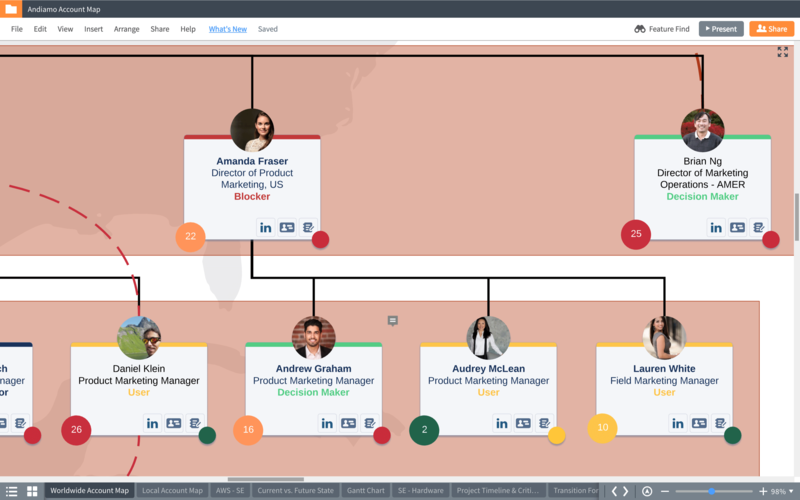 See how the Lucidchart Sales Solution can help you find the best path to sale. 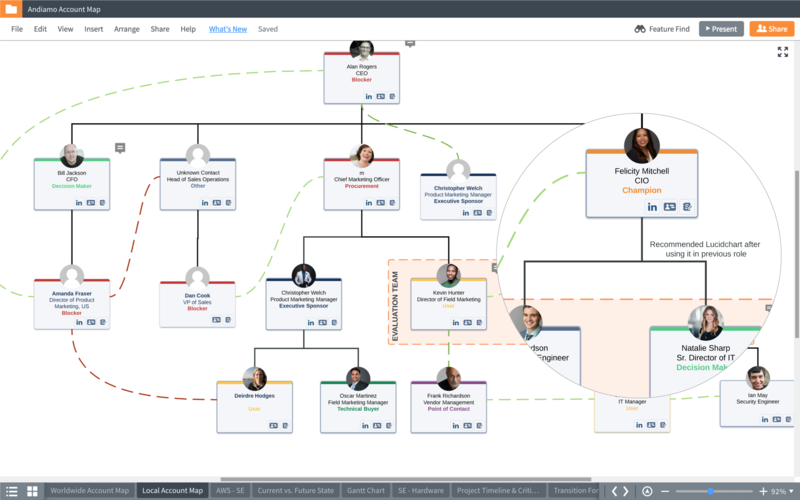 Lucidchart empowers you to quickly build account maps to better understand your deal and identify decision makers and key relationships. With our Salesforce integration, you can import and easily format Salesforce contact data to facilitate understanding and discover next steps toward closed-won. Your CRM gives you valuable data, but it doesn’t show you the complex relationships that can make or break a deal. By building account maps in Lucidchart, you can create a holistic view of the account and use that knowledge to build rapport, solidify relationships, and explore new opportunities. 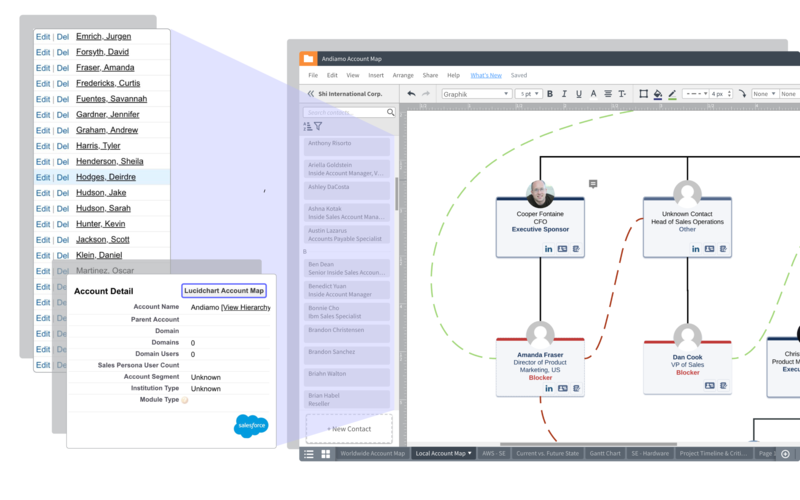 Lucidchart eases the pain of territory realignment and account transitions since account maps quickly communicate the inner workings of an organization. Our Salesforce integration keeps account maps tied to Salesforce records, so when an account changes hands, you can easily review the deal’s history instead of wading through CRM data. Account maps offer leadership true visibility into the deal—and the better your leaders understand your accounts, the more support you’ll have. 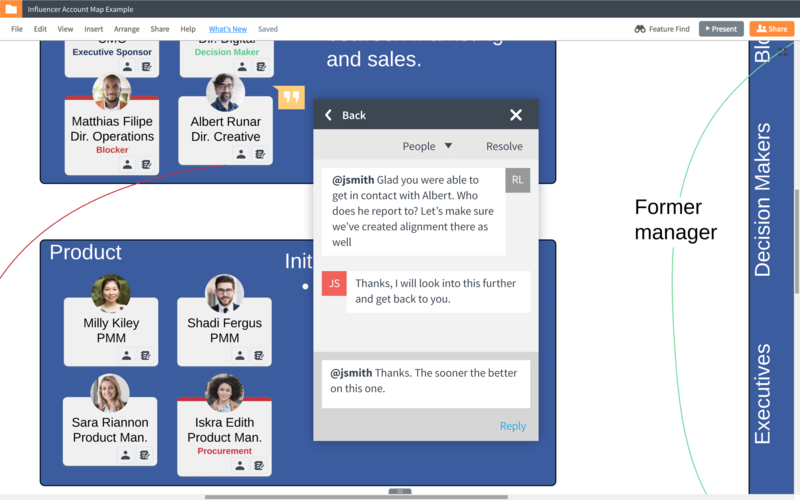 Lucidchart makes it simple to share visuals and collaborate in real time so you can receive coaching, gain executive sponsorship, and amplify your influence. Once a deal has been qualified, we try to outline the political landscape of a company. We're looking for who's my champ, who are my influencers, who are my people that are problems that we need to overcome. So we'll make an org chart, and based on that, there's kind of a coding of who each person represents, because we target field operations, marketing, and then obviously the sales leadership area.